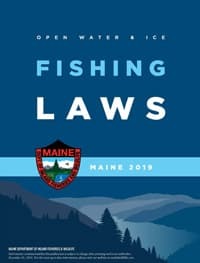 It is unlawful to import any live baitfish or smelts into Maine. Licenses expire on December 31st of the calendar year for which they were issued. It is unlawful for any person to deal in live baitfish or live smelts without first obtaining a valid dealer's license. This license permits the sale only of live baitfish and live smelts from one location. For application and laws, see information below. Note: If you plan to sell baitfish or smelts from more than one location, each additional location must be licensed by a Live Bait Retailer's license. This license permits the taking from the wild, wholesale and retail sale of live baitfish only. Does not include smelts. This license permits the taking from the wild, wholesale and retail sale of live smelts only. When using drop nets to fish through the ice for baitfish/smelts, all holes made in the ice must be marked either by evergreen boughs placed around the hole, or by suspending at least 1 strand of fluorescent biodegradable tape at least 3 feet above the ice around the entire perimeter of the hole so that the tape is visible from all sides.